If you have any ideas to improve how NCDOI serves you, let us know through our online Suggestion Box. The Fire and Rescue Commission staff coordinate and operate the State Fire and Rescue Incident Reporting System (NCFIRS), serve as the state representative and coordinator for the US Fire Administration and the National Fire Academy, and manage the state's voluntary certification system, which is comprised of 28 subjects and has more than 100,000 fire and rescue participants. The Fire and Rescue Training Division Trains North Carolina emergency services personnel in fire and rescue practices, Provides upgrade training to fire and rescue instructors and Hosts specialized training schools. The Research and Program Development Division facilitates curriculum/training development and related audio/visual materials, through programs like Pocket Tools Training, for Fire/Rescue and Injury Prevention programs. In addition, this section designs and develops informational and educational materials for publication and distribution to the public. The Fire/Rescue Grants and Relief Funds Administers and processes the Volunteer Fire Department and Volunteer Rescue/EMS grant programs as well as the Firefighter Relief and Rescue Workers Relief Funds. Together, both sets of programs collect and disburse over $12 million annually. The Ratings and Inspections Division is responsible for inspecting and surveying fire districts for minimum 9S requirements for fire protection under the North Carolina Response Rating System (NCCRS). The division also serves as a resource to fire districts, local governments and emergency personnel who need assistance with district mapping, record keeping, contract agreements, benefits, and more. Every year in North Carolina, some 200 children die from accidental injuries and another 45,000 visit a doctor’s office for treatment of such injuries. Safe Kids North Carolina works to prevent these injuries in children 14 and under through education and outreach. The Injury Prevention Section of the NC Department of Insurance- Office of State Fire Marshal serves as a resource to local programs for support regarding injury prevention from birth to senior adults. The Manufactured Building Division Serves as the State Administrative Agency for the Department of Housing & Urban Development (HUD) for the State of North Carolina. Assures that manufactured homes are constructed in accordance with federal standards and installed in accordance with North Carolina regulations. During the 2009 legislative session, the North Carolina General Assembly passed Senate Bill 563 and created N.C. General Statute 58-82A-1 aimed at preventing pyrotechnic disasters and/or tragedies from occurring in North Carolina. The new law requires anyone discharging/operating pyrotechnics or proximate explosives to attend a training course and earn a pyrotechnics operator license before conducting a pyrotechnics display in North Carolina, effective February 1, 2010. 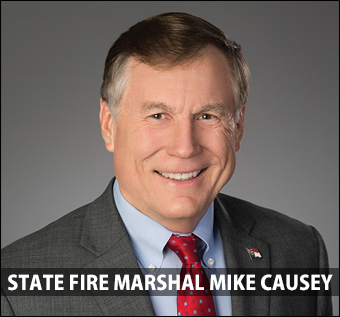 Fire Safety Programs is both a resource for the general public and fire service personnel of North Carolina regarding legislation that has been implemented to protect the public from fire. The Risk Management Division seeks to minimize the adverse effects of property and casualty losses to the State and to the public through building code administration, facility inspections, risk management services, and a wide range of insurance coverages.